It seems the NEW YORK POST published a cartoon by Sean Delonas which was in response to the MONKEY SHOOTING in Connecticut but also included a not so subtle BARACK OBAMA JOKE. 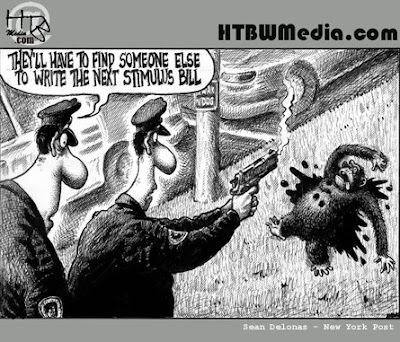 The COMIC which showed two cops standing over a monkey that had just been shot and saying "They'll have to find someone else to write the next stimulus bill. I guess one could consider that racist, however, the way I look at it (as you can tell by the title of this blog) is that we we are all MONKEY's. So what do you think, is this cartoon racist or is it just good clean Monkey fun?